A childhood fascination with the natural world inspired Pat Godin to carve his first bird in 1967. He continued to carve in those early years solely for his own pleasure. In the early '70's Pat became aware of several competitive exhibitions of decorative duck decoys and other wooden bird sculpture. After meeting other enthusiastic bird carvers and picking up a lot of ideas and technical tips his work quickly became competitive at the "World Class" level of competition. 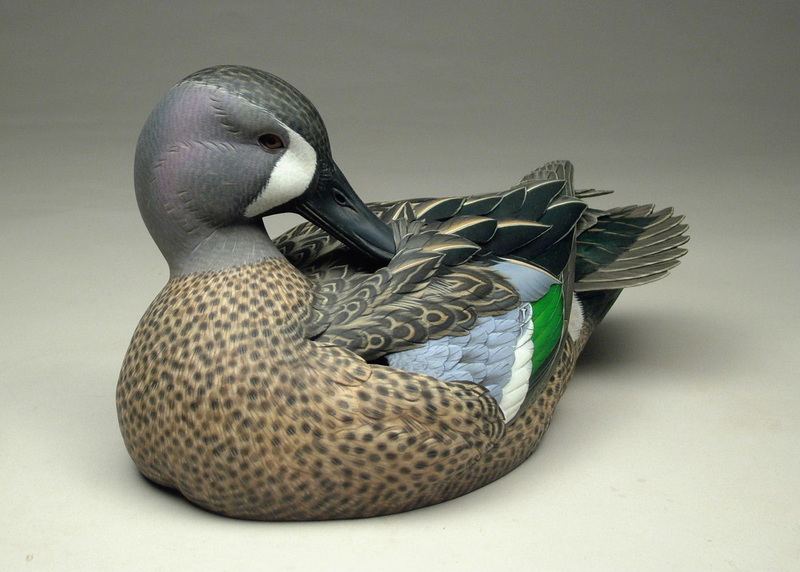 Since his bird carving career began Pat Godin has gained international recognition for his fine, accurate renditions of wildfowl as well as for the creative vision present in his pieces. With a formal background in wildlife biology and ornithology it is no accident that his work exhibits not only accuracy in form and color, but also radiates the life of a real bird. Throughout the years of 1972 to 1979 Pat studied at the University of Guelph, Guelph, Ontario and acquired an Honors B.Sc. degree in Wildlife Biology as well as M.Sc. degree by conducting research on Mallard ecology. In addition to acting as an undergraduate ornithology instructor, he also worked extensively with waterfowl and other species of birds while engaged with the Canadian Wildlife Service. Pat also was accepted as a research assistant at the Delta Waterfowl Research Station in Manitoba, Canada in 1976 where he helped graduate students conducting various studies on Redhead Ducks, Wigeons, Mallards, and the Western Grebe. In 1976 an innovative pair of Common Goldeneyes carved by Pat was judged "Best in World", beginning a string of twelve World Championship titles. These include subsequent World Championships in 1980, 1984, 2008, and 2009 in "Decorative Decoy Pairs" and in 1982 and 1995 in "Decorative Lifesize Wildfowl Sculpture". He followed this in 2000 with a Second in World placement in World Class Miniatures with a carving of a Sharp-tailed Grouse entitled "Prairie Courtship", in 2001 with a Best in World title for a carving entitled, "Spruce Grouse on the North River", and in 2002 with another Best in World placement for a carving entitled, "Prairie Dance - Greater Prairie Chicken". These miniature pieces are a part of a series Pat will complete, featuring all of the species of North American Grouse, performing their breeding displays. Pat accomplished an unprecedented achievement in 2001 by winning Best in World in the fourth of five World Championship categories, the World Shootin' Rig. The winning entry featured a pair of Black Ducks with a drake Mallard-Black Duck hybrid carved in a gunning decoy style. 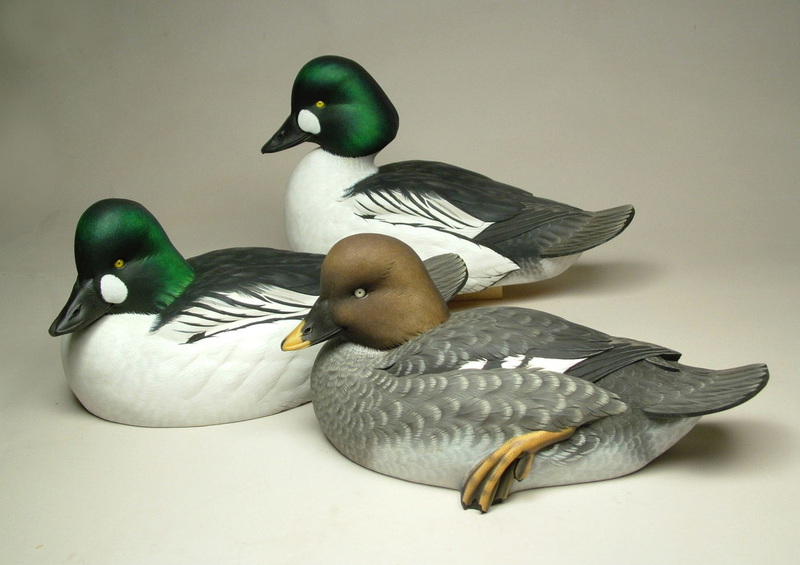 In contemporary decoy competitions the hybrid was an interesting and unique concept, since the idea had never been attempted before, and also since it represented something that is quite common in nature. Most recently in 2011 Pat was awarded his twelfth World Championship for his carving of a miniature scale Prairie Chicken entitled "Battle on the Lek". Many other awards include "Best of Shows" at the Canadian Open Wildfowl Carving Competition, Toronto, the Gulf South Carving Competition, New Orleans, the California Open Carving Competition, San Diego, the Pacific Flyway Competition, Sacramento, the North American Wildfowl Carving Competition, Detroit, and the Northern Nationals Wildfowl Carving Competition, Minneapolis. Work by Pat Godin can be found in the Ward Museum of Wildfowl Art, Salisbury, Maryland and in many private collections and has been exhibited at the Smithsonian Institution, Washington, D.C. The prestigious "Birds in Art" exhibition held at the Leigh Yawkey Woodson Art Museum, Wausau, Wisconsin has featured Pat Godin's work for ten years. In 1993 Pat was invited to represent North American carvers at the opening of the International Bird Carving Exhibition in Yokohama, Japan. Although competitions have provided some of the inspiration for Pat's work, his deepest concern has always been with the cultivation of bird sculpture as an art form. Over the years Pat has become respected as a writer and lecturer. Through seminars and workshops he communicates new techniques as well as the philosophy behind his art. Pat Godin also wrote, illustrated, designed and published three instructional books for bird carvers (Championship Waterfowl Patterns, Volumes One, Two, and Three). Recently he collaborated with Stackpole Books by illustrating and providing text for Reference Guide: Waterfowl II. 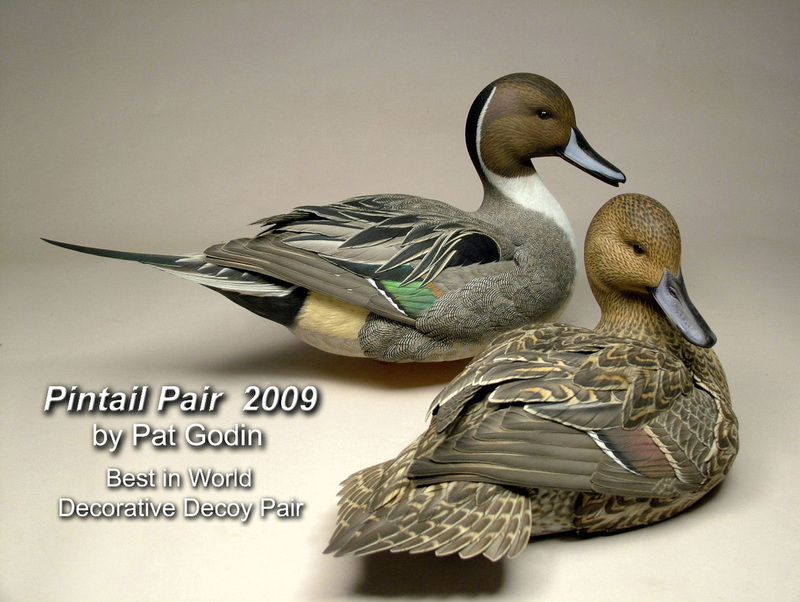 In November 1994 Pat Godin was inducted into the Waterfowl Festival Hall of Fame, Easton Maryland. He was also honored by his home town of Brantford, Ontario with an induction in the the Walk of Fame in December 2001. This included a bronze plaque with his biography, in the city along with other notable inductees including Wayne Gretzky and Alexander Graham Bell. Pat currently resides with his wife Jessica near Paris, Ontario.